Graviky Labs is an MIT Media Lab spin-off based in India and it has come up with one ingenious solution to air pollution problems in Asia: convert polluted air into high-quality printing ink. Fascinating, isn’t it? All it requires is a device called Kaalink to be attached to your vehicle’s exhaust pipe and it just filters and captures unburnt carbon emitted by the engine in cases of incomplete combustion. The technical details of the process have been kept a secret for now. How exactly does it get converted to ink? That is also not up for grabs yet. Sharma ensures that the ink produced on the other end is indeed high-quality and can be sold to both consumer and industrial markets. For now, the Kaalink device has to be installed manually by drivers. As soon as the device is full to the brim, it can be swapped at the Graviky Labs for an empty one, while the other is packaged into printing ink. 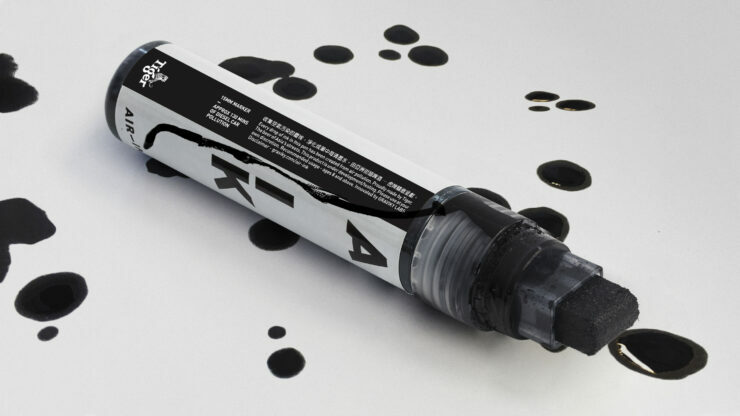 The Air-Ink concept has been going around for almost 3 years now. Graviky labs had collaborated with Tiger Beer to launch a proof-of-concept awareness campaign in Hong Kong. Painters and street artists got the first hands-on experience with the Air-Ink markers, pens and spray paints. The test results of Kaalink show that it captures about 93 percent of the emitted pollution from the standard vehicle combustion engines. But to produce only one ounce of ink, it takes up to 45 minutes! Heck, it takes about 2 weeks’ worth of driving to produce enough ink to fill the apparatus. The idea is brilliant nonetheless. For it to be effective, it obviously needs to speed up the process significantly by having more processing facilities in different areas. The project also needs to be scaled up significantly to have a solid impact on the environment.